Like a first impression, an author has one sentence, one chance to make in initial impression on the reader. We’ve all come across lackluster openings, openings that didn’t inspire, or confused, or simply made you scratch your head. Maybe you kept reading, maybe not. What a tease! and I’m instantly curious. Is she used to the cold? Was she planning on spending so much time outside? Is this normal weather? Time to find out what this wine tastes like. My first sip was fantastic, and it just got better from there. 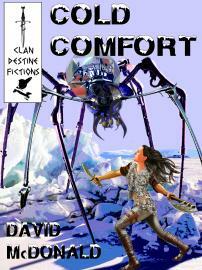 in “Cold Comfort”, Vanja is a traveling trader, going from settlement to settlement. McDonald doles out the worldbuilding slowly and subtly, almost a mirror of Vanja’s distrust of strangers. She’s in search of a settlement called Halstead, ostensibly to trade her goods and pass on news of the world, but in truth to see if the rumors are true. The observant reader will figure out pretty quickly what’s going on her, but we’re reading this story with a lot more information than Vanja. She does indeed reach Halstead, to learn they haven’t had a visitor from the outside in a very long time. She hopes their desperation for news and new items will bode well for her profits. It occurs to her too late to question why so few residents seem interested in her wares or even excited to have a visitor. I was incredibly impressed with the manner in which the worldbuilding specifics were revealed. The “big reveal” wasn’t a surprise, but it was all the small details that made this story shine for me. I got so invested in Vanja and curious about Halstead and its residents that when the story did end my reaction was what happens next?? In “Through Wind and Weather” a freighter pilot named Nick has a very special delivery. But the Thao Beta system is experiencing a solar storm of historic proportions. Everyone tells Nick to turn back, but his attitude toward this delivery is “now or never”. I want you to think about the scale of a binary system’s solar storms for a minute, where the massive fiery stars belch out unsurvivable quantities of radiation. You can’t run from it, you can’t go around it. Pretty scary. Nick’s semi-sentient ship knew the risks of this mission when it chose Nick to be it’s pilot. It volunteered. Again, I enjoyed the worldbuilding, and I especially enjoyed the relationship between Nick and his ship. On the second read through, I picked up on a few more hints as to what was really going on. I think a lot of people will get a chuckle out of the end of this story, but unfortunately the closing scene really fell flat for me. I believe this story was originally written for a themed anthology in which the final scene makes perfect sense, but read away from that theme, it didn’t quite work for me. “Our Land Abounds” is a post apocalyptic surreal horror story where the “winners” have no idea that this is a game with no winner. Kessler and his family live in “The Lucky Country”. One of the few places left on Earth with a functioning economy, natural resources, and “happy” citizens. People are encouraged to report suspected non-patriotic behavior, prejudice against foreigners (or even locals who are of a different ethnicity) is status quo, and your skin will crawl as you watch these characters act like everything in their life is completely normal because they don’t know any different. Kessler is a decorated war hero, and these days his job involves interrogating illegal immigrants. He begins to question what’s happening, but is there anything he can really do about it? This is one of those stories that keeps you thinking long after you’ve finished reading. When the treaties have been signed, and the soldiers have gone home, do the winners owe the losers anything? Is a post-war Earth a place where every person/county is an island? Do we owe it to our fellow humans to treat them with humanity after all sides have committed atrocities? “Our Land Abounds” is just long enough to ask those questions. You’ll have to answer them yourself. If you come across Cold Comfort and Other Tales (here’s the amazon page so you have no excuse), I highly recommend it. Author David McDonald won the 2013 Ditmar Award for best new talent, and in 2014 was shortlisted for the WSFA Small Press Award. He is also the winner of the 2014 William J. Atheling Jr. Award for Criticism or Review. You can learn more about David at his website, Ebon Shores. 3 Responses to "Cold Comfort and Other Tales by David McDonald"
Oh I absolutely love your description of why first lines are important! Totally agree.